Here’s a new giveaway offer for you, Paco Rabanne is giving away a customized candle for a gift with purchase. 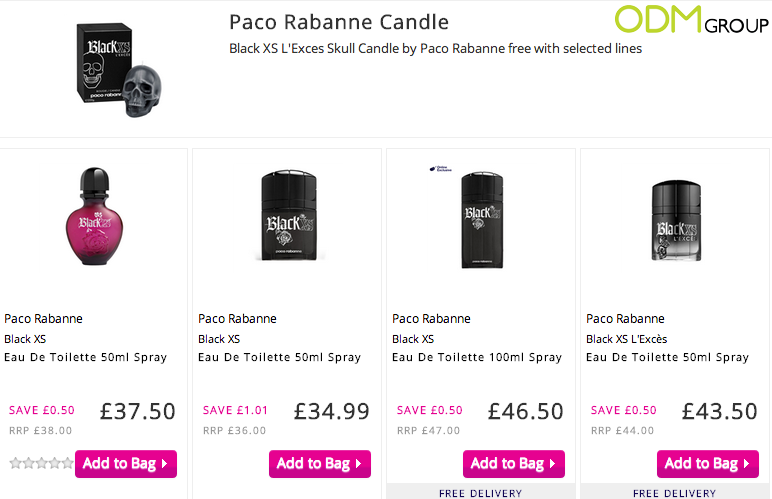 Simply purchase selected Paco Rabanne fragrances to get your hands on this exclusive deal! What are you waiting for, head down to The Fragrance Shop now! Paco Rabanne is a Spanish fashion designer who started his own fashion house in 1966. He is known for his flamboyant fashion designs and for using unconventional and interesting materials such as paper and plastic. Why offer customized candles as a free gift with purchase? Customized candles can be designed into any shape and design that you wish to have for your promotions! For example, Paco Rabanne decided to design this candle in the shape of a skull for promoting his line of Black XS perfume. The color of the candles can also be customized as well! Thus this design and black color really complements the promotion going on and is sure to help boost the sales of this fragrance line! These customized candles are really inexpensive as well thus it is perfect for companies who have a limited marketing budget. Even though the gift does not cost much, customers will still appreciate the amount of thought that went into it. Your customers will also be able to use these customized candles! They can light it up for a romantic night with their other half as they enjoy a candlelit dinner together. Get started on your very own custom marketing products today! Contact us here at ODM and we will be glad to assist you in to making these products come to life!